Real mayonnaise, with a 70-80% oil content, is thick, spoonable, creamy, opaque and doesn’t flow. Such a high oil concentration is, of course, high in fat. So in recent years, the search has been on to produce mayonnaise with all the taste and textural qualities which people love – but with less calories. 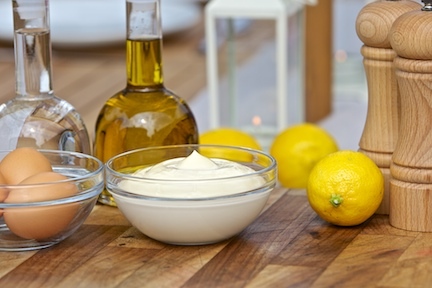 Try to reduce the oil content of your mayonnaise, however, in pursuit of a lower fat product and you can end up with something which flows like single cream. Reduced fat mayonnaise, which meets consumer demands for healthier product choices, has to be able to mimic the above properties of real mayonnaise. We can show you how. As well as preventing separation between the oil and water, these large hydrocolloid molecules are able to mix with the oil globules and inhibit movement – meaning your mayonnaise stays thick, creamy and opaque. All will require stabilisation during the aqueous phase – but the mouthfeel characteristics and texture will be very different. Contact us today for advice. Our approach to problem solving is based firstly on ensuring you have the right mayonnaise for your chosen end use. A reduced fat mayonnaise which may work perfectly in a sandwich may be completely unsuitable for use in a layered salad, for example. We can also help you find solutions to some of the adverse reactions which can occur when producing a lower fat mayonnaise. Our team has extensive experience of these potential adverse reactions during development – and how to avoid them. We can help you solve the problem or find a work-around solution. We can also advise on which materials to avoid in certain developments and which combinations will help you achieve the required mouthfeel and textures. Contact us today for advice on tackling your product issues. The basic ingredients of mayonnaise are oil, water, egg and vinegar. Because oil is a relatively expensive ingredient, costs can be reduced when lower oil formulations are put together. The balancing factor, however, is the cost of the water mobility control agents. Talk to our team today about how we can help you produce a better reduced fat mayonnaise – for less.